The lingual nerve supplies sensory innervation to the same side of the tongue. Injury to it can occur during the extraction of lower wisdom teeth or other surgeries within the oral cavity. Its lesions can cause loss of tactile sensitivity and taste. In half of the cases the symptoms may be painful. Chewing on the affected side is impaired because the tongue does not feel the food and cannot distribute it between the dental arches. Moreover, an insensitive tongue is often chewed inadvertently. These functional deficits generally involve psychological distress, leading sometimes to a reactive depressive syndrome. The remedy consists of a microsurgical reconstruction of the nerve. The lingual nerve is a sensitive branch of the mandibular division of the trigeminal nerve. Its lesions can give rise to changes in its sensory function (dysaesthesia): a complete lack of sensitivity (anaesthesia), reduced sensitivity (hypoaesthesia), or a pathological increase in sensitivity (hyperaesthesia). Moreover, in half of the cases the major symptom is pain. The latter can be subclassified as “painful anaesthesia” (spontaneous pain with a feeling of a “phantom limb” in the area of the injured termination), hyperalgesia (a painful feeling with even a light touch), or hyperpathia (delayed pain sensation in response to a pressure stimulus), sympathetic-mediated pain (pain maintained by sympathetic tone, in response to cold or emotional contexts and alleviated by α adrenergic inhibitors). The incidence of lingual nerve lesions is second only to those of the inferior aveolar nerve during wisdom tooth extraction. 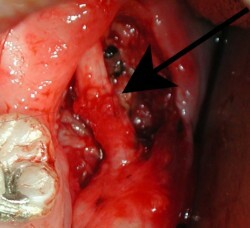 The lingual nerve may be cut due to its course immediately underneath the periosteum, behind the wisdom tooth alveolus. Tearing this structure with a dissector may expose the nerve and lead to its damage. Also, retracting the soft tissues may compress the lingual nerve and injury it temporarily. Generally, definitive lesions are due to nerve sectioning with a scalpel or the sharp edge of a dissector, rather than with a burr that comes into contact with the nerve inadvertently. The lingual nerve is also at risk of damage during surgery for the removal of stones located within the ducts of the submandibular gland. This happens especially when repeated inflammatory episodes have resulted in scar healing in the lateral floor of the mouth. During such interventions, the identification of the white lingual nerve in the context of white scar tissue can be particularly difficult. 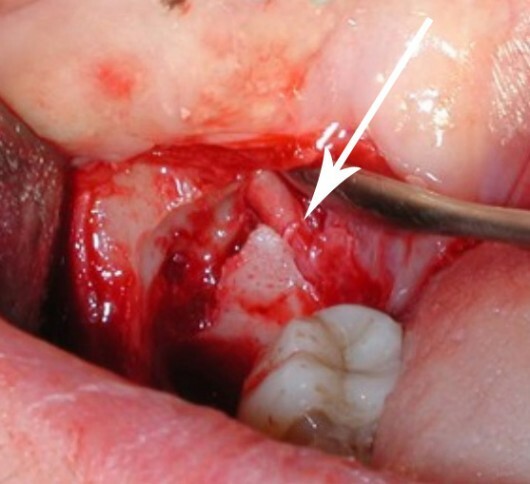 Reduced visibility because of an intraoral approach, rather than the ‘classical’ percutaneous route, may also enhance the risk of lesions to the nerve. The same dynamic may occur during the treatment of ranulas in the posterior floor of the mouth. Moreover, in these cases, past infections can make sparing the lingual nerve more difficult. 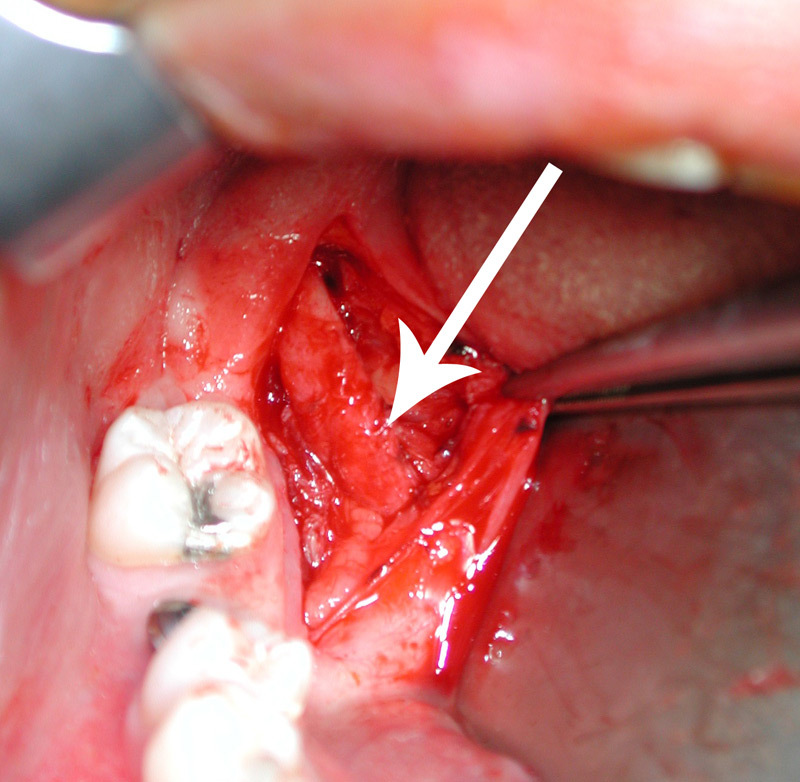 Block anaesthesia of the lower alveolar nerve can also injure the lingual nerve because of their continuity. Such injury is caused by the effects of the neurotoxic anaesthetic (in particular, articaine and prilocaine). Other pathogenic hypothesis are related to direct needle injury and compartment syndrome that results from increased pressure inside the epineural sheet, with subsequent ischaemic damage. If there is no pain, the biggest deficiency may be limited to a chewing disorder, because the impossibility of feeling the food prevents the tongue from distributing it between the dental arches. Some changes in speech may also occur, but the biggest deficit for the patient is often represented by the psychological discomfort linked to the lack of sensitivity of the tongue. If the symptoms are painful, deterioration in the quality of life may be dramatic. Moderate pain, but one that is present constantly, could exhaust anyone, leading to a reactive depressive syndrome. The management of patients with pain should be immediate. Surgery may be undertaken also after a long period, but percentages of success decrease a time last. The ideal time for the reconstruction is 3 months after the lesion. This is appropriate to allow for a spontaneous recovery of functionality to take place in case of a temporary lesion. Surgical intervention is performed under general anaesthesia because local anaesthesia cannot ensure appropriate conditions for an operation. General anaesthesia ensures the correct surgical conditions: complete immobilisation of the surgical field for microsurgical work, the possibility of extending the operating field as needed, and duration of anaesthesia for any intervention time (typically, 1 2 hours). 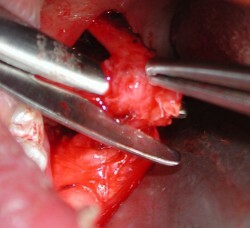 Surgery is performed classically with microsurgical techniques – under the high magnification provided by a surgical microscope – and often involves reconstruction of the lingual nerve with very fine sutures (polypropylene 10/0). Sensory recovery generally begins within the first 6 months after microsurgical reconstruction and often achieves most of its potential by 24 months, although the evolution of functional recovery may be prolonged, up to for 8-10 years after surgery. Recovery of tactile sensitivity – good, though never complete – occurs in most cases. Taste sensitivity generally shows a good degree of recovery. Whether there is a time limit for surgical intervention is unclear. Clearly positive results decline in percentage beyond 24 months after the lesion. Over that time period, the regenerative stimulus may be reinforced by taking part of the nerve fibre ingrowth from the contralateral healthy lingual nerve. The surgery is called a cross-tongue procedure. The Seddon classification is still used widely today for its simplicity and practicality. It provides for three degrees of injury: neurapraxia, axonotmesis, and neurotmesis. Neurapraxia may occur with simple compression or traction of the nerve and corresponds microscopically to its oedema. Generally, complete spontaneous healing takes place within 2 months and no treatment is necessary. Axonotmesis involves lesions of nerve fibres within the nerve despite its continuity. The nerve undergoes retrograde degeneration of the fibres involved and then their regeneration. Even in such cases, the spontaneous recovery of function, sometimes incomplete, is predictable but with a higher degree of variation, from 3 to 6 months. Neurotmesis is characterised by disruption of a complete section of the nerve. The consequences are the complete loss of sensitivity, accompanied or not by spontaneous painful sensations. Limited partial recovery may occur because of partial innervation in the anaesthetic area by adjacent nerves.